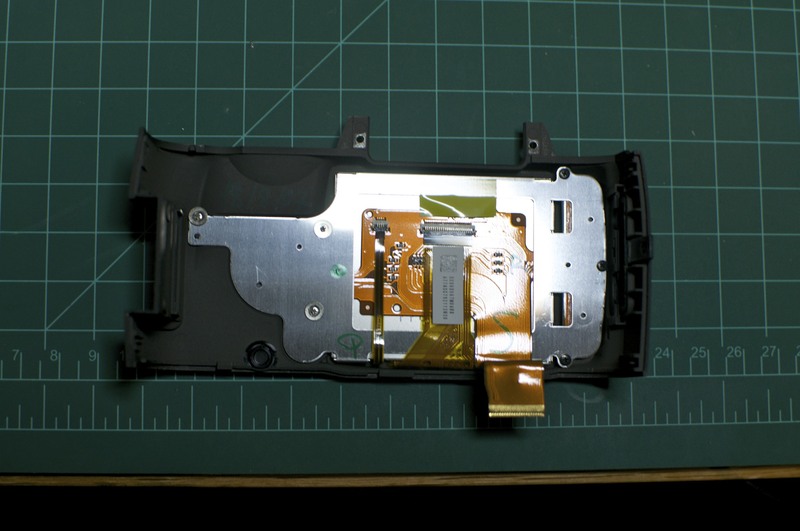 Most, if not all, digital cameras have some sort of plastic cover on top of the LCD. The plastic cover protects and seals the LCD from damage. If the LCD cover gets hit hard enough it cracks. If your LCD underneath looks like someone spilled ink on it, then you’re out of luck, the LCD will need to be replaced as well. Replacement parts are easy to come by. 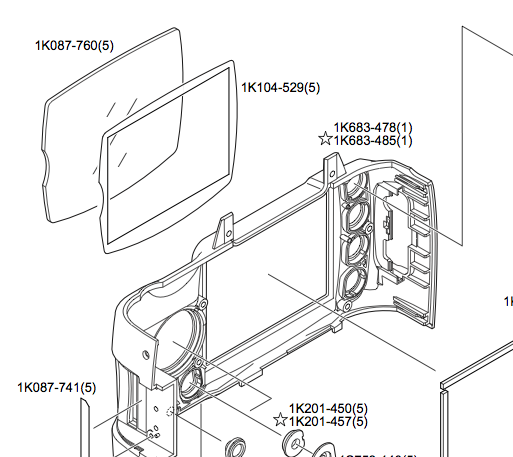 You’ll need part numbers 1K087-760 (D40 window) or 1K087-870c(D60 wind0w) and 1K104-529 (the tape). 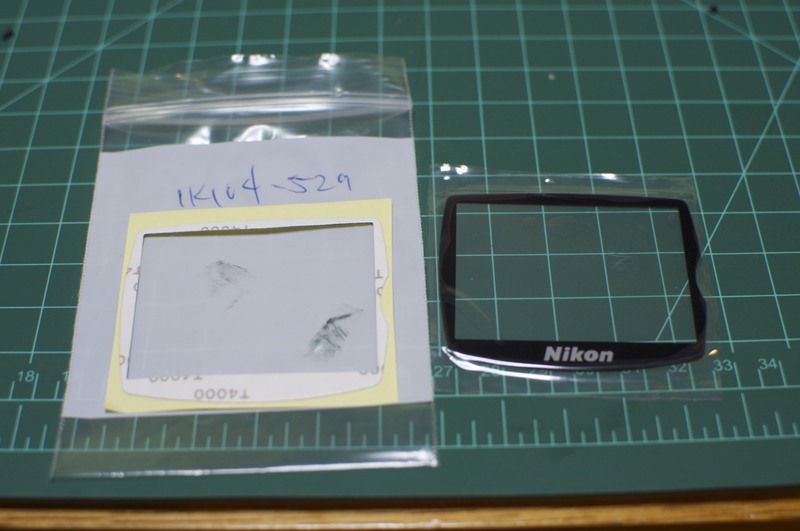 The cheapest parts can be head directly from Nikon 1-310-414-8107. You don’t need to be an authorized dealer or repair shop, anyone can call and order parts from Nikon. They’ll even look up parts for you if you don’t know the part number. 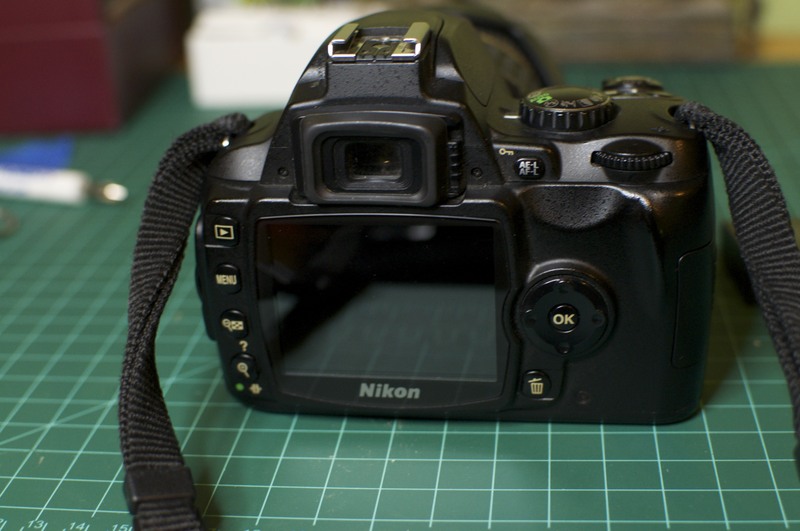 UPDATE: As of July 2012 Nikon no longer sells repair parts to the public. You can find the parts on eBay. You can try local camera repair shops, but Nikon no longer sells to them either. Replacing the LCD window is easy enough. Start by removing the bottom cover. Keep track of the screws. There are a few near the batter compartment that are longer, and one hidden screw beneath a small flap also near the battery compartment. Also don’t forget the ones near the bottom of the lens mount. The bottom cover should lift off, nothing else is attached to it. Next remove the rear cover. Its got screws on each side, near the eyepiece, and under the SD card door. Remove the SD card. The rear case will not come out with a card installed. 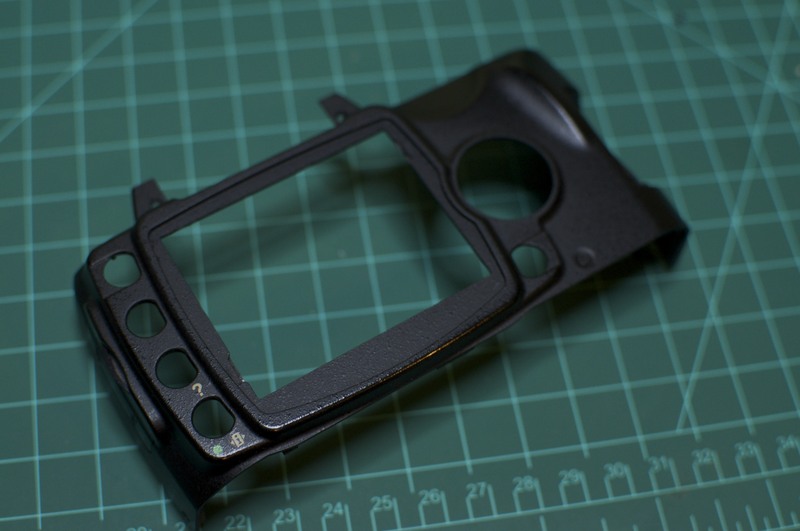 The rear case will be held on by one ribbon cable. 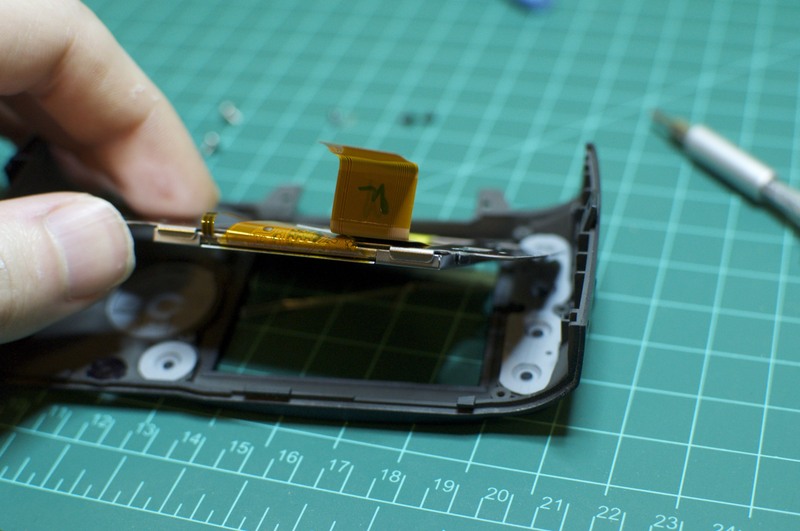 Flip the latch up and slip out the ribbon cable. 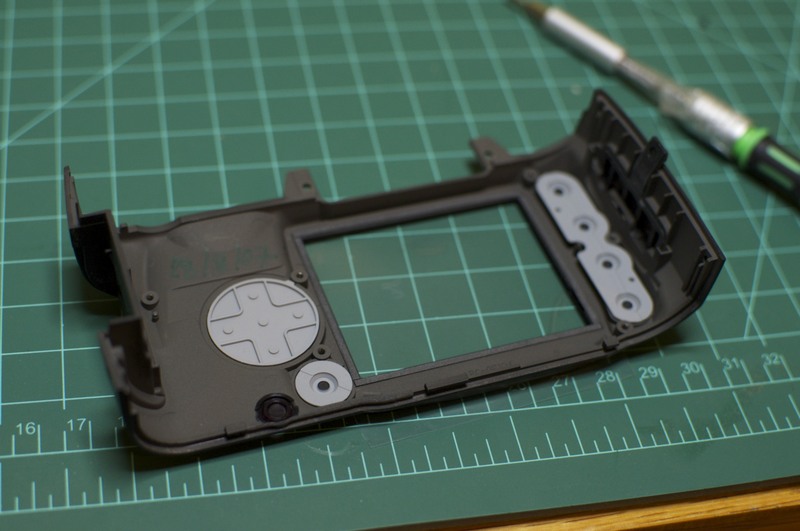 Flip the case over and the remove the screws holding the metal backing plate to the rear case. 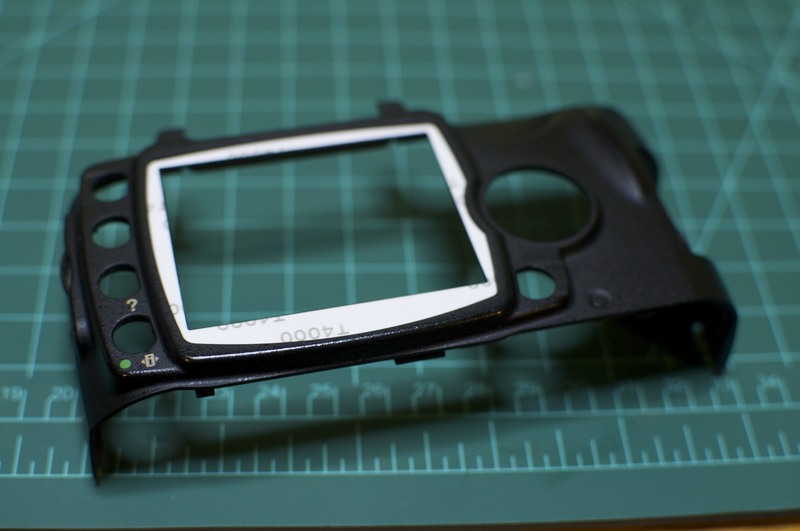 Getting the LCD cover out of the rear case can be tricky, the glue is very strong. I pushed the cover from the back and it cracked in two, then I removed the broken pieces. Remove any of the doulbe sided tape that did nto come out with ehthe LCD cover. Apply the new tape to the rear case keeping one side of the paper backing on, that way you can press down on the tape getting a good seal. The new LCD cover should come with some protective film. Remove the film on the back and align one side to the rear case. Avoid touching the uncovered side of the LCD cover, finger prints will be stuck behind the cover FOREVER. If the buttons fall out don’t worry, they are all keyed and will only go in one spot. Now put it all back together! where did you buy the lcd window replacement? Cheaper and more reliable to order directly from Nikon like the article says. Just got my parts today. BTW, excellent post! I just finished replacing the window on my D40 using this. Every instruction is dead on. 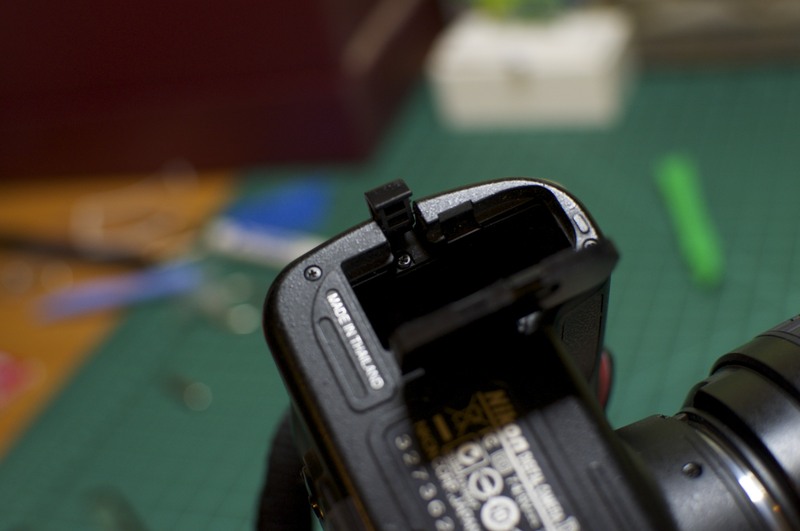 Only tricky part was figuring how to flip up the black latch to release the ribbon cable. Just get a thin flat head under and gently flip up. Take care not to scratch or damage the ribbon cable. Thanks, the instructions were great. One thing I noticed about removing the old LCD cover – there’s a small notch that you can fit a flat head screwdriver under to pop the old cover off. They’re located on the bottom left and upper right side of the LCD cover, if you’re looking at it from the inside of the camera body. Great post. I’m having a hard time reseating the ribbon cable. Do you have any hints? Or photos of this part of the process? Thanks! Make sure the flip up plastic lock is up. The ribbon will not go very far into the connector. The latch is what holds the ribbon in place, not the contacts. I don’t understand why you needed to take everything apart for this. The plastic window can be prized out from the outside with a small screwdriver, then a new window inserted directly from the outside. Did you need to replace the LCD as well? The window is held on with very strong adhesive. If you want to risk cracking your case and gouging your LCD, then by all means take a screwdriver to it. I don’t live in US and Nikon in this country refuse to sell parts to consumers, requiring me to send my camera back to their service department for repairs. I don’t live in the capital where the service center is located, so it would probably have cost me well over $100 with shipping and all included. I was able to buy the parts from Nikon US shipped to a friend in US who was kind enough to forward it to me. If I had not had that option Ebay would have been a good alternative. I was able to pries the old glass off without damaging the LCD at all. Of course you want to be careful doing this, that goes without saying, but I feel personally it would have been a bigger risk taking everything apart and ending up with a bunch of parts I didn’t know how to fit together again and/or damage in other ways. The German video is interesting in that it seems to skip over removing the old glue (I used a small screwdriver to carefully remove the gum/glue bits) and they also didn’t seem to use the tape (1K104-529) before inserting the glass. I agree, I noticed the same thing in the German video. I assume they must have applied the tape prior to putting the glass back in place. I forgot to mention that Nikon US would only ship to a US address. That kinda made my reference to Ebay a little incoherent. Exactly what I did. I wasn’t confident in the ribbon either! Whole thing has taken 15 mins. Thanks for your post. I’m trying to disassemble my D40 not to replace a cracked glass, but to replace the 4-way button, which seems to be stuck in the “up” position (contantly scrolls through the various data screens while trying to view my shot –whatta pain!). Anyway, got the back completely off, took out the 3 screws holding the metal backing plate to the case. That’s as far as I get. I can’t get the metal backing plate off — it seems to be affixed where the three things that look like metal grommets or rivets are. I’ve tried working a thin blade underneath and twisting to the point of nearly tearing the metal. What’s the secret? Or maybe another question, do I have to go in from the back (like I’m currently attempting) to replace the 4-way? Wonderful post!!! 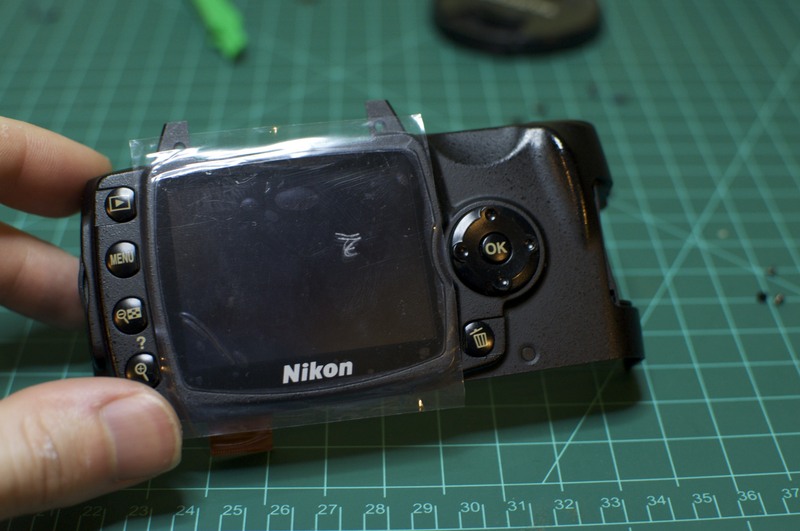 I was quoted over $100 to have the camera repaired (just to replace the lcd window). The parts were less than $10 directly from Nikon. It took me a little under one hour to replace the window from start to finish. It probably could have been done a lot quicker, but I was taking my time and making sure that I had everything documented, as it’s easier to take something apart than put it back together. The instructions were dead on, although I might suggest a couple of simple diagrams of the camera (back, side, etc.) outlining the different screws, as some of them are different sizes. I didn’t experience any problems with the ribbon cable, as I left it attached and just carefully worked around it (I have a DX40). My camera was in excellent shape, but unfortunately I picked up a couple of noticable scratches on the window. It looks brand new now. Much thanks for taking the time to post these detailed instructions!!! Thanks so much for posting this how-to. I almost lost my previously eaten lunch when I turned over the back cover and all of the buttons fell out onto the floor and the chair. A flashlight and some time on the floor on my hands and knees and they were all found and properly reseated. Thanks again, couldn’t have done it without you! Great, used for D40x, Brill, biggest issue was when dropped a screw!!! Hi…. I love this article and am calling Nikon on Monday to order replacement parts. My outer screen isn’t cracked, but when I turn the camera on it looks like it’s cracked on the inside. So, do I need to just order a new LCD screen? I have a picture of it posted on my blog. http://simplyfinephotographyblog.blogspot.com/2012/08/camera-reapir-ohhh-nooo.html If you could take a look at it and maybe give me some advice… I would really appreciate it. Thank tiy so much. Yes, all you should need is the LCD, which is actually easier than changing the window. You can buy the LCD on eBay for about $25. Update: found the cover and tape on eBay for $8.99 USD, including shipping and handling. Could you post a link to the Nikon UK site where these parts are available? I’m not sure about the UK, but in the US nikon stopped selling parts direct to consumers around 2012, so your best bet would probably be eBay. Exactly the same happened to me. I had to order it from Amazon.co.uk .